'Crazy Rich Asians' follows the story line of Rachel Chu and her boyfriend Nick. Originally the first book of a trilogy, “Crazy Rich Asians” by Kevin Kwan is a fun, intriguing story about Rachel Chu (Constance Wu) whose boyfriend Nick Young (Henry Golding) takes her to his home country of Singapore for a friend’s wedding. There, she learns that Nick is actually ridiculously rich — and so is his family. Rachel, who is the daughter of a single immigrant mother, is thrust into a world of bachelorette parties on private islands, world famous cuisine in billion dollar houses and her boyfriend’s acquisitive family who do not appreciate the heir to the Young fortune dating an ordinary girl. This movie boasts some beautiful visuals. Since the story revolves around people living extravagant lifestyles, the director Jon M. Chu is able to play with rich, vibrant color that sells the story and the emotions that come with it. At some points in the movie, the larger than life sets transport the audience into a different world that they couldn’t otherwise experience. Though the themes were a little on the nose, “Crazy Rich Asians” explores the themes of friendships, relationships and family ties very acutely. These themes are not subtle, but they are woven into the plot in a way that does not necessarily feel forced. Especially important to this movie are the mother-child bonds that influence the personalities of the main characters. Rachel and Nick’s relationships with their mothers are juxtaposed subtly, breaking the tone of the movie, but to a great effect on commentating on the nature of family bonds. Overall, this movie is super entertaining. It taps into the fantasy of having a rich significant other and more than delivers that dream to its audience without sacrificing all of its depth. So extremely well written. I’m so proud of you Miss Nat! 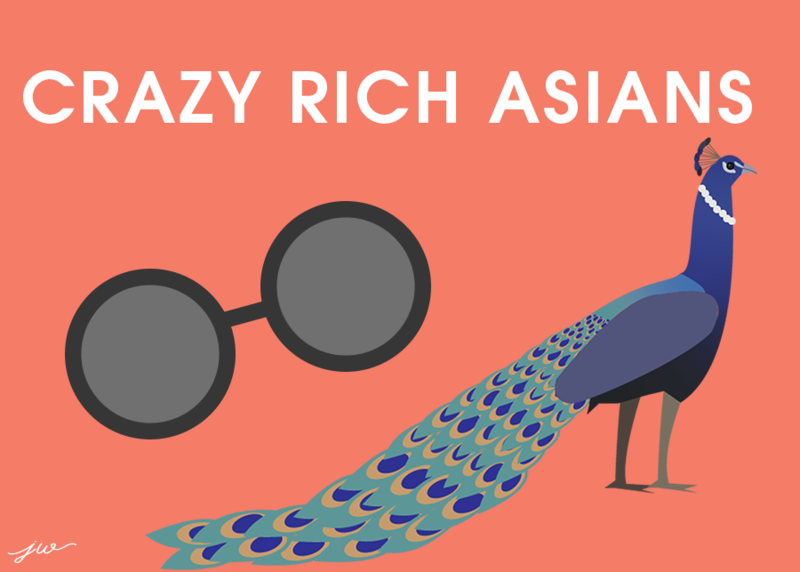 “Crazy Rich Asians” the book, is far more complex than the movie. From the incorporation of Singaporean vernacular to the addition of layers of rich history for nearly all the important families within, the book feels more organic than its blockbuster counterpart. This gives the audience far more time to connect with Rachel and fall in love with the writing style, but it also poses problems for engaging the casual reader. The book boasts an impressive cast of characters, but Kwan is sloppy in introducing them. The first page of the book is quite intimidating: a family tree including 50 members of three interconnected families and a blurb accompanying each. There is not enough time to get to know all the characters well enough, so it’s safe to say Kwan should have stuck to a more limited cast. However, the characters the audience does get to know are rich and deep, somewhat balancing out the shallow side characters. This book pulls the audience in with its originality, humor and the absurd amount of wealth strewn across the pages. While it may be easy to get lost amongst the pages of history or names, Kwan manages to bring the readers back to the grounded Rachel who is going through the same experience as the readers — being engulfed in a world dominated by luxury and status. Through Rachel’s eyes, the story is filtered to an accessible level, allowing the reader to enjoy the world without drowning in it. If you are looking for quick entertainment, you’d be better off watching the movie. But for those who want to enjoy an escape from the world with an all-encompassing novel, this is the book for you.